Paul John Hansen Wants Probation Terminated! – Kent Hovind v. Robert Baty – The Great Debates! Home→Paul John Hansen Wants Probation Terminated! 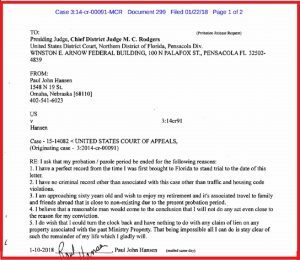 Paul John Hansen was tried along with Kent Hovind in 2015 and was found guilty of at least one charge and was sentenced to a few months in federal prison to be followed by 3 years of Supervised Release (Probation). He was released from prison and began his period of Supervised release a year or so ago. In January of 2018 Mr. Hansen filed a motion requesting that his Supervised Release be terminated because he has been such a nice guy (I don’t believe it) and because he is getting old and wants to travel abroad. I vote that termination be denied, but my vote does not count. We’ll just have to wait and see what the judge decides. 1. I have a perfect record from the time I was first brought to Florida to stand trial to the date of this letter. 2. I have no criminal record other than associated with this case other than traffic and housing code violations. 3. I am approaching sixty years old and wish to enjoy my retirement and it’s associated travel to family and friends abroad that is close to non-existing due to the present probation period. 4. I believe that a reasonable man would come to the conclusion that I will not do any act even close to the reason for my conviction. 5. I do wish that I could tum the clock back and have nothing to do with any claim of lien on any property associated with the past Ministry Property. That being impossible all I can do is stay clear of such the remainder of my life which I gladly will.